It’s been a couple of weeks since we left Topo, but I’m looking back and want to share more about the city and its citizens. 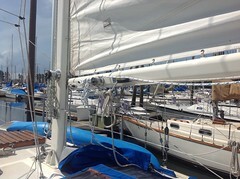 I’ve uploaded pictures on the blog, under the “Sailing photos” tab. The marina and city are 14 miles in from the sea. There are breakers during low or ebbing tide across the shoals. Once inside the channel, it’s a piece of cake. The large bay has a dredged channel for the petroleum ships. Off the main channel lies the secondary channel, be prepared to have a second person with binoculars glued to their head to find the buoys and keep a very close eye on the depth sounder! 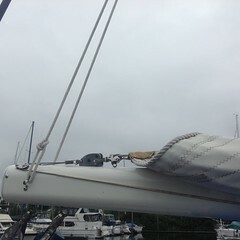 The marina is off the second channel when you locate it, and will take you across very shallow water in some places. Be sure to go in on the high slack water. Beware of the garbage floating that also resembles homemade buoys, they look the same! The city is built around and on top of a large rock hill. The main road circles the hill, the oldest part of town is in ruin and very dirty. The “newer” portion is a little more kept and cleaner, that’s where the restaurants are, closer to the newly built malecon. Palm and banyan trees grow everywhere. Chickens and stray dogs roam freely around the homes and streets. Friendly folks live here but very little English if at all. 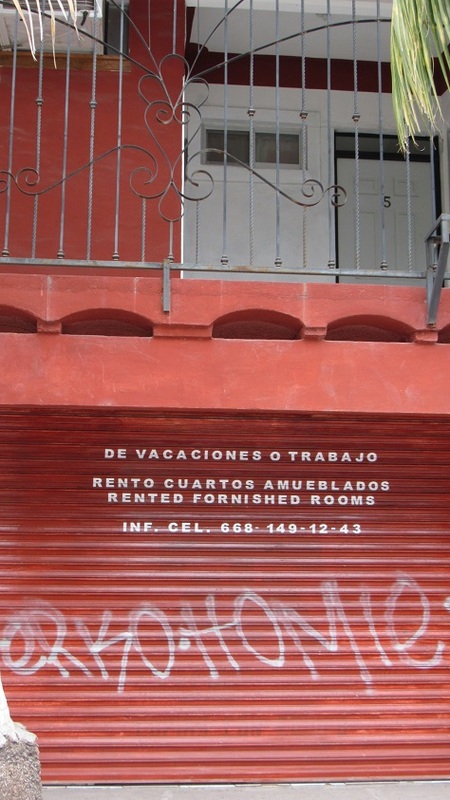 We felt safe walking the streets despite being linguistically challenged and very obviously “out of place”. Very few Gringos travel to this remote city. The community is comprised of local farm workers, laborers from the gas plant, shop keepers and bus drivers. 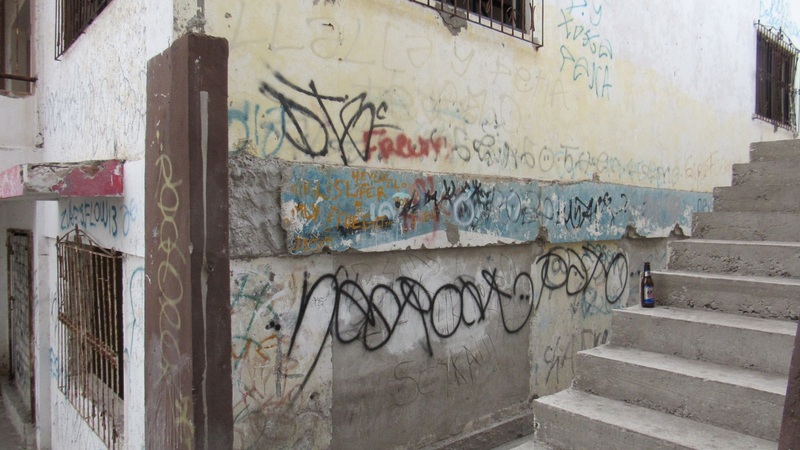 Most of the city is run down, homes have fallen to disrepair, littered with tons of plastic trash, stray dogs, broken down sidewalks, and dirt streets. And yet, the government spent an overwhelming amount of money creating a malecon along the bay hoping to bring tourists. They overlooked the peoples’ homes and daily needs, the need to collect trash, educate the citizens to reduce the usage of plastic, create a sewer treatment plant, help build local infrastructure that could sustain those who sit unemployed on the malecon. The government made another tremendous error in overlooking the dirty bay that can’t even sustain fish, that is so murky you’re afraid to touch the water for fear of contamination, further reducing the appeal to boaters who help create jobs and enhance the livelihood of a port city. The reputation of corrupted Sinaloa state officials continue to drive Topo further into financial distress. The drug cartel made Los Mochis (15 miles away) and surrounding areas their home. Travel sites will try to deter you from visiting. I’m sure there are well founded reasons. You see it in the marina. 50′ yachts that have U.S hailing ports look suspicious, the local owners drive into the parking lot in expensive imported cars. They have money that doesn’t come from farming or rental properties in Topo, that is a for sure. No matter where you live, the graffiti artists emerge. They all have one thing in common, the tagging language is artistic but undecipherable to the average folk. We ate at a restaurant and our happy waiter spoke perfect English. He was about 20 years old and talkative. We asked him how he mastered the English language so well. He said he grew up in California but was deported about 2 years ago. He was sent back to Topo to live with relatives. It was a sad story. But he was excited to serve us as we were the only Gringos to ever eat there. He added that very few tourists even come to Topo. Aside from the poverty and primitive living conditions, I loved Topo. The people are kind and proud, they quickly give you a warm smile, greet you with respect, and welcome you to their home. I felt very connected to them. There is so much natural beauty in the vicinity. As the sun sets the large bay shimmers below the cactus covered mountains. The air is clean, the sky is beautiful blue, it’s sunny and warm, the food is fresh from the fields, the locals live a simple life. Sunday is family day at the malecon. Music, food carts, kids play on the playground equipment, cars drive through the small town with their radios blaring enjoying the evening air, it’s a festive time. They laugh and play to make up for the strife on other days. I would love to see the Topo citizens, the underdog city rise up from poverty level, they deserve it. We found an apartment for rent, fully furnished too! Not sure we’d really consider living in Topo, but most certainly leaving Konami there in the marina for a short time would be just fine. Out of the hurricane zone, a dedicated dock worker to look after her in our absence and very cheap compared to expensive marinas such as LaPaz or Puerto Vallarta. If you’re traveling through Mexico, look to some of the outlying cities for the real flavor of the people and culture, you’ll be pleasantly surprised. 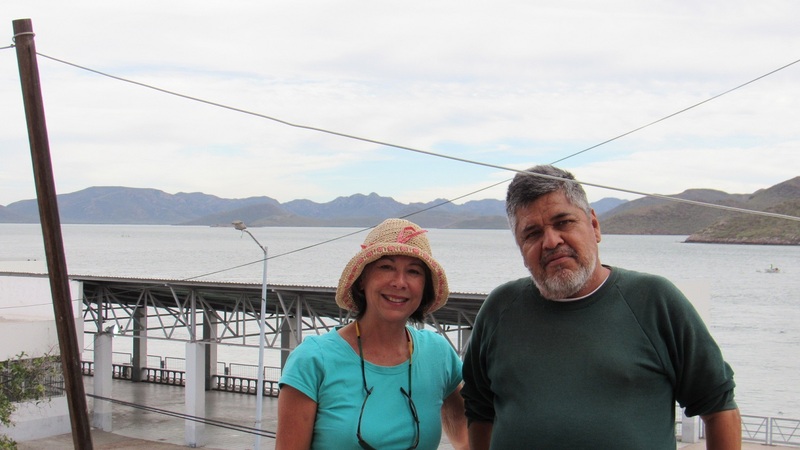 We departed Isla Espiritu Santos, Jan 2nd, with our buddy boat Anjuli bound for Topolobampo, a small rustic city about 200 nm north of Mazatlan. Getting into the marina harbor was a bit of a challenge with a shallow entrance with breakers along the sea buoy, long 10 nm main channel and a secondary shallow channel at high tide with limited buoys and markers for another 4 nm. It is so far inland that the city’s underdeveloped sanitation system creates very murky water. But we didn’t come here for the marina, it was a place to dock and leave the boats for a train excursion to Copper Canyon. The four of us departed at 6:00 a.m on a train headed for Creel. The 9 hour train ride wound through a high mountain range with spectacular scenery, deep canyons with boulders larger than sailboats, a 1000 meter tunnel followed by 85 shorter tunnels, numerous primitive towns, 4 different forests – ( more on that later) of varying species of trees, a high bridge that crossed over the mountain lake, and a gained elevation of nearly 8,000 feet. At 7,700 feet is the small town of Creel where the Tarahumara, an indigenous Indian tribe reside. Copper was actually mined back in the late 1800’s but today the feature is the deep canyon and in some places, is actually deeper than Arizona’s Grand Canyon. The water and wind eroded the geological formations where giant boulders balance atop pinnacles several hundred feet tall. The Tarahumara tribe took up residence in some of the caves, and a few families continue to live there today. Some live in primitive dwellings on the rocky hillsides. We saw a few of the people disembark from a bus carrying large 50 pound sacks of staples, waited at the roadside for the pack horses to arrive and carried it home. A very proud, spiritual people who lived off the land growing corn and beans found peace and meaning with nature’s geological formations. Most of the people now live within the small town of Creel in primitive dwellings, some with thatched roofs, outdoor cooking accommodations and stick limb outhouses. They wear their colorful traditional dresses but a few women wear tennis shoes replacing their leather sandals. They have dark, deep set eyes, rarely smile at you and weathered faces reflect their meager existence. The women weave baskets and shawls and sell them sitting along the sidewalks or stand at the train stations hoping tourists will purchase their works. The children walk with handfuls of baskets and other trinkets hoping tourists will purchase something from them. They perform all the menial labor jobs of running a small town catering to tourists. Surprisingly, we met very few Americans. Mostly Europeans and South Americans arrived and this is the peak of tourist season. When we arrived it was raining off and on, we were totally unprepared for cold windy weather. We didn’t bring any warm clothing and being so accustomed to mostly 80 degrees living in shorts and t-shirts, we didn’t even think about hats and gloves. Our first clue that we might be cold was the Europeans boarding the train at 3000 feet wearing fur lined parkas, hats and gloves with wind blown faces. The hotel was very nice with colorful tile and stone. Large tiled bathroom with hot water too,(the marina here doesn’t have that) but the propane radiant heat couldn’t keep us warm enough. It was very cold sleeping in our socks and clothes. The second day out was sunny but cold and a little more tolerable. We visited the museum, entry fee was 10 pesos, just a token. There is a mummy in a glass case with no environmental protection. The cold air may be enough to prevent further deterioration. It appears to be a very small person, perhaps a child as the Tarahumara people are not small boned. It is amazing to see, most of the skin was still intact. The body was preserved with palm fronds and mud, and the arid heat made for rapid drying. The extreme cold preserved it from decay. A picture shows the mummy when it was unearthed, it was in a position that is difficult for the human body to maintain at time of death. The rest of the museum was full of pictures of the tribe’s people, pictures of the Copper Canyon developer and later generations, tools used by the Indians, baskets, and some Christian influence artifacts. In whole, the museum catalogs the Indian tribe and history. Back to the Forests. There were lush tropical, dry, and pine, changing with elevation. Coming up the mountain from sea level we passed large farms with modern disc and plow equipment, but the workers pick the crops by hand. Bus loads of workers picked the crops of giant tomato plants, potatoes and green beans. It looked just like the farm lands in Oregon with migrant workers. As the train climbed we watched the cactus covered hillside change to greener foliage and flora. We passed through hillsides of green deciduous trees inter populated with pink blossom and white blossom trees, alder, oak, and madrone. Further up, the forest changed to tropical trees as the canyons provide hot humid air. Mango, banana, guava, orange and grapefruit trees were growing everywhere. There were trees with large fluffy balls hanging from the limbs. Even higher, the rocks became house sized boulders, columns of solid rock, compressed hardened ash pillars, covered with various fauna and trees. A yellow bark tree grows very tall and the exposed yellow roots twist themselves around the rocks, hanging along the cliff walls. The lodge pole pines were the last forest at the highest elevation. Dry dirt covered with deep layers of pine needles, giant boulders provide root protection for the tall windswept pine trees. The bear grass like plants similar to Oregon’s high desert and alpine scenery send up tall stocks of flowering bulbs. Breathtaking scenery, you can’t pull yourself away from the windows. Divisadero, the last stop before Creel, the train stops for 20 minutes to allow passengers to disembark and take pictures overlooking the deep canyon. Food vendors line the streets with hot grills and pans of various meats, beans and cooked cactus. For 20 pesos = $1.15 US, you can purchase scrumptious Gorditas made with corn, filled with potatoes, or meats and beans. Truly mouth watering food. 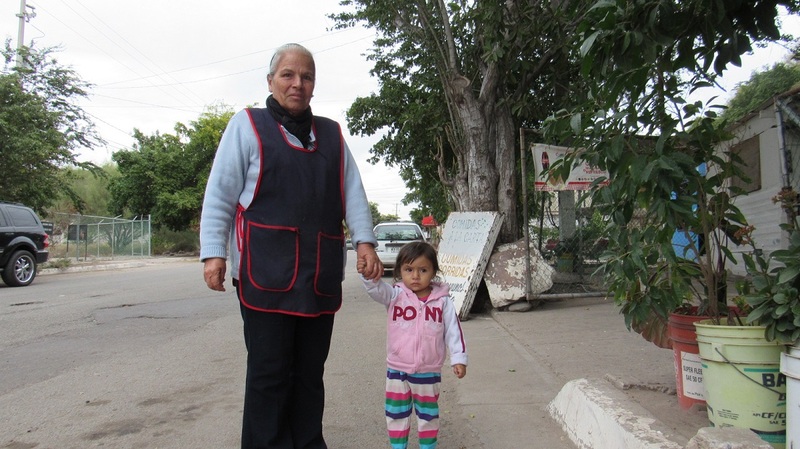 Children sell bags of delicious apples, and the Tarahumara women sell their hand woven goods. If you have a bucket list, make this place a destination. We won’t forget this place, and even still, I ponder the Tarahumara people and their traditional way of life is endangered. LaPaz, and the festive holidays came and went so quickly. LaPaz is a fascinating city, the people, sights and sounds. We loved every moment there, especially the bus rides and “hiking” the streets. The sidewalks end abruptly, partial sand, large potholes and gravel then back to concrete, or drop off 2 feet and if you’re not paying attention – wind up on your face or with a twisted ankle. Certainly not ADA approved. Christmas was surreal in 80 degrees wearing shorts and t-shirts. There wasn’t a build up of holiday activity, the Christmas carols were in Spanish. We went to a couple of movies, missed the Hunger Game movie though. 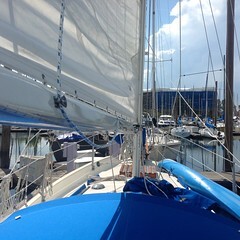 We had a terrific potluck on Konami with our buddy boat group- Dan and Tammy from Anjuli, Bjarne and Barb from HokuPaa. 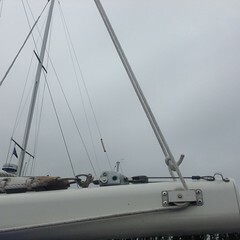 Tor and Jessica from Yare had dinner with another “kid boat” anchored in the bay. Tammy roasted a fantastic turkey with all the trimmings, Bjarne baked wonderful rolls and rice pudding. The 26th we took our last knobbed showers, heavily provisioned to last 30 days straight, and departed for Isla Espiritu Santo, the famous marine park 20 miles NE of LaPaz. 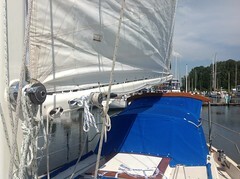 After having spent 2 weeks tied to the dock, we were looking forward to being on the open water again. 3 hours of big waves and wind on the nose was actually enjoyable as we bashed our way north and dropped anchor in 10 feet of water within calm San Gabriel. A beautiful pristine bay protected by looming cliffs. Turquoise water and white sand beach line the bay just below the red cinder and steep walls of lava flow that slope into the sea. We’ve moved from inlet to inlet, some rolly due to waves wrapping around the points, northers blowing but we’re protected up close to the cactus covered canyon walls. Beach combing, hiking, snorkeling with our wetsuits has been awesome. We toasted 2016 at 5:00 Mountain time.,(12:00 UTC or GMT or Zulu time) on the beach of Isla Partida, Ensenada Grande cove with our good friends, met a kayaking couple from French Polynesia who invited us to their home in Moorea,(we happened to have as a waypoint in our cruising plan), very enjoyable potluck, drank champagne, lit sparklers after the sun set. If the wind speed and direction change today and tomorrow, enough for the seas to lie down, we’ll head out beyond the beautiful marine park. A plan written in sand waiting for the tide to wash it away, as the old saying goes. We wish you a wonderful 2016, full of laughter and love, abundant joy, and giving to others!